Shuck corn and steam for 3 minutes. When corn is cool enough to handle, cut the kernels off ear and place them in a mixing bowl. Halve tomatoes vertically, and cut one half into 4 wedges for garnish. Remove seeds from remaining tomatoes. 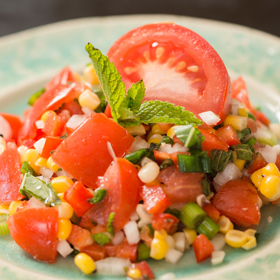 Chop tomatoes and add to corn. Add red pepper, green onions and sweet onion. In a small bowl, whisk lime juice with salt, mustard powder, and 4 or 5 grinds of pepper until salt dissolves. Pour dressing over salad and toss gently with fork to combine. At this point, salad can sit for up to 15 minutes. Just before serving, stack basil leaves, then cut crosswise into thin strips and add to the salad. Add mint, if using. Toss to combine herbs with salad. Garnish with tomato wedges. Serve immediately. Serving size: 1 cup. Amount per serving: 45 calories, less than 1g total fat (0g saturated fat), 10g carbohydrates, 2g protein, 2g dietary fiber, 242mg sodium.